The M4 rental in Las Vegas is a fun way to experience the Vegas strip. You can rent a BMW for a day, weekend or even monthly. Luxury Car Rental USA is the number one source for BMW rentals in Vegas. 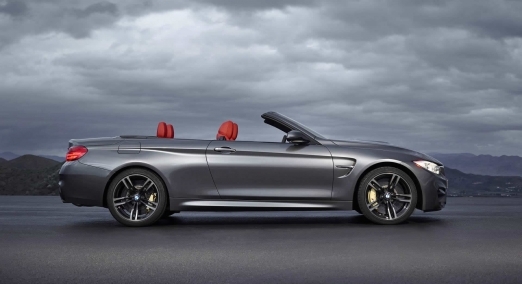 This new M series hardtop convertible pushes the boundaries of speed and styling. It is an affordable high-performance sports car that is a pleasure to drive and will make your trip to Vegas memorable. Out of all the Las Vegas BMW rentals we provide this is one of the most requested. Cruise the Las Vegas strip with the top down in an M4 convertible. Rent an aggressively powerful and incredibly precise BMW M4 today in Vegas and you’ll be pleasantly surprised. The legendary M4’s most prominent feature is the twin-turbo inline-six cylinder engine. The V6 comes with a high-pressure, zero lag turbo with TwinPower and BMW’s double-VANOS technology that adust camshaft timing to allow more pressure buildup inside the cylinder for extreme power output. The German engineered engine is combined with a 7-speed dual-clutch transmission. Paddle shifters allow the driver full control with instant shifts. The trademark 50 percent front, 50 percent rear weight distribution makes this one of the best handling exotic car rentals in Vegas. After dring this beautiful BMW rental you will agree that it is worthy of wearing the M badge. 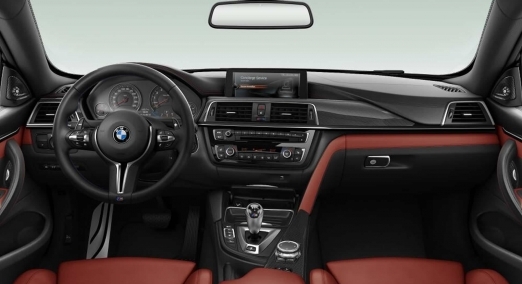 The interior on the BMW M4 is both luxurious and sporty. The beautiful bucket seats hug your body like a glove and come with a 10-way power adjustment to get a precise fit. Developed by the M division at BMW, the M4 wears the M badge proudly on the leather race-inspired seats. The log is even backlit to remind you this is not your average 4 series BMW. There are also subtle M touches throughout the vehicle like the M colored stitching on the steering wheel and M badges on several components. Step behind the wheel of your favorite BMW sports car rental in Las Vegas. Call us today and we’ll try our hardest to put you behind the wheel of your dream car. The cost to rent an M4 in Vegas is around $395 per day but can fluctuate during different times of the year or during special events. We offer Las Vegas BMW M4 rentals for a day and for weekend getaways. Delivery is free to McCarran Airport and all the Vegas strip hotels including the SLS, Bellagio, Wynn, Aria Four Seasons, Encore, The Bellagio, Mandarin Oriental, Venetian, The Cosmopolitan or Caesars Palace. We also provide discounted rates for weekly and monthly car rentals in Vegas.